EHS sophomore Kennadi Rockhold (center) brings the ball up court past the Waterford press, during Eastern’s 53-44 setback on Monday in Tuppers Plains, Ohio. TUPPERS PLAINS, Ohio — A championship-clinching win with a game-sealing run. 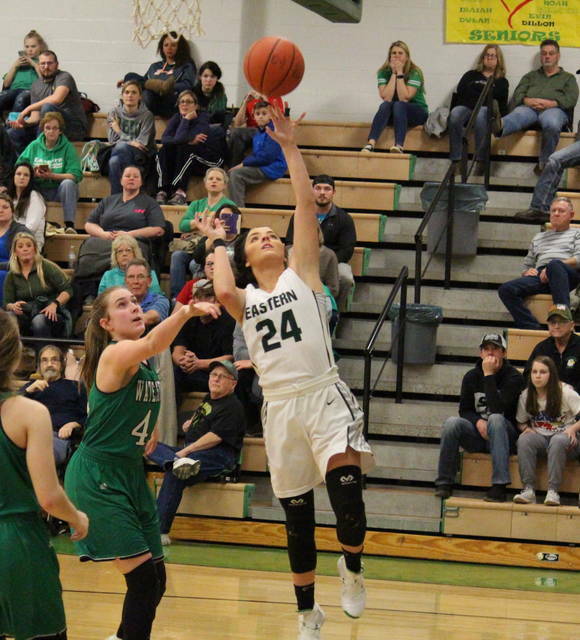 The Waterford girls basketball team closed Monday’s Tri-Valley Conference Hocking Division bout at Eastern with a 13-to-2 run, giving the Lady Wildcats a 53-44 victory and at least a share of their fifth consecutive league title. Waterford (13-2 13-0 TVC Hocking) scored the first six points of the game, holding Eastern (10-8, 9-3) off the board for 2:50. The Lady Eagles stormed back with an 11-to-3 spurt and took the lead for the first time, at 11-9, with 25 seconds left in the first. Waterford tied the game at 11 on the final bucket of the opening quarter, and then the Lady Wildcats scored the first four points of the second quarter. The teams swapped the lead three more times in the period, with Eastern’s advantage growing as high as six points, at 25-19, with 1:35 left in the half. WHS hit a pair of free throws in the remainder of the half, trimming the Lady Eagle lead to 25-21 by the break. Waterford made the opening bucket of the second half, but Eastern scored the next six points and led by eight, at 31-23, with 5:35 left in the third. The guests responded with a 12-to-3 run, regaining the edge with 2:43 left in the period. The hosts tied the game at 35, but a 5-to-2 spurt gave WHS a 40-37 lead with eight minutes to play. EHS senior Alyson Bailey made back-to-back baskets to open the final quarter, giving EHS a 42-40 edge with 6:37 remaining. The Lady Wildcats were back in front with a 4-0 run, before EHS senior Kelsey Casto tied the game at 44 with a two-pointer at the 4:12 mark. 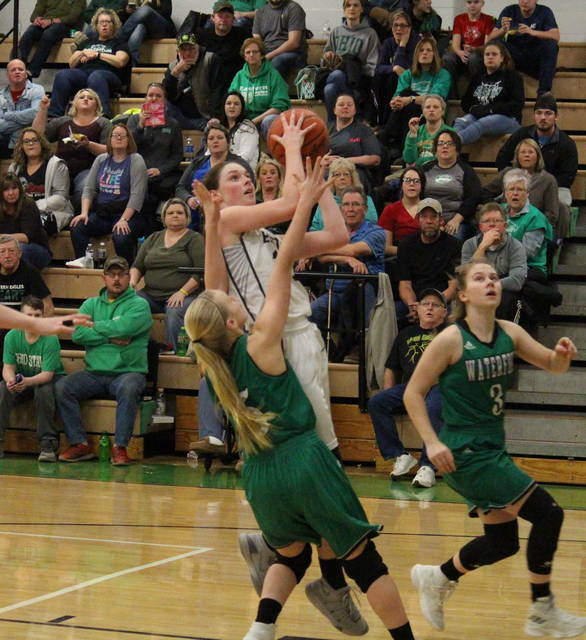 The Lady Eagles were held off the board for the remainder of the game, however, as Waterford scored nine unanswered points to cap off the 53-44 victory. Following the setback, Eastern head coach Jacob Parker was upset that his team lost, but was pleased with its effort in competing against the No. 7 team in the most recent Division IV AP poll. “It’s like I told the girls, ‘never be happy with a loss, but you can learn from losing if you compete,’ and we completed tonight,” Parker said. “We had to see where we were as a team before tournaments, and I think we got a good look at where we’re at. I’m not mad about where we’re at, we just have a few minor things to adjust. For the game, the Lady Eagles shot 17-of-42 (40.5 percent) from the field, including 3-of-13 (23.1 percent) from three-point range. Meanwhile, Waterford hit 19-of-56 (33.9 percent) field goal attempts, including just 1-of-13 (7.7 percent) three-point tries. At the free throw line, EHS was 7-of-19 (36.8 percent) and Waterford was 14-of-31 (45.2 percent). The guests won the rebounding battle by a 36-to-27 count, with a 16-to-7 edge on the offensive glass. Eastern committed 22 turnovers, nine more than WHS, with eight of the Lady Eagles giveaways coming in the final period. 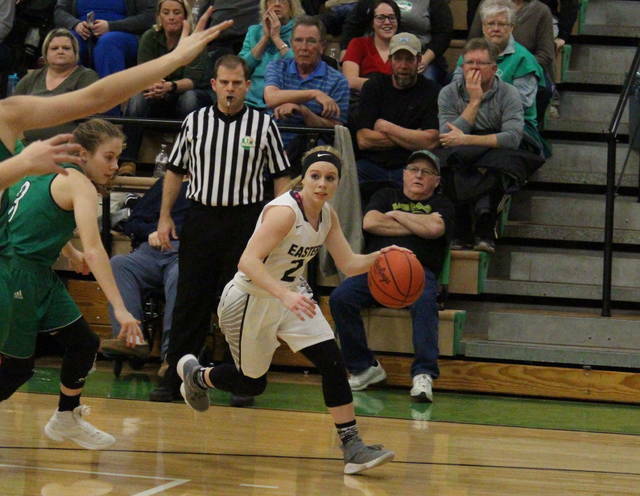 Collectively, the hosts earned 11 assists, seven steals and a blocked shot, while the Lady Wildcats combined for 12 steals, 11 assists and a rejection. While happy with the overall effort Coach Parker acknowledged that for his team to reach the next level, they’ll have to eliminate their opponent’s spurts. Bailey led the Lady Eagle offense with 11 points and four assists. Olivia Barber and Jess Parker scored 10 points apiece, with Barber grabbing a team-best seven rebounds, and Parker hitting a game-high two trifectas. 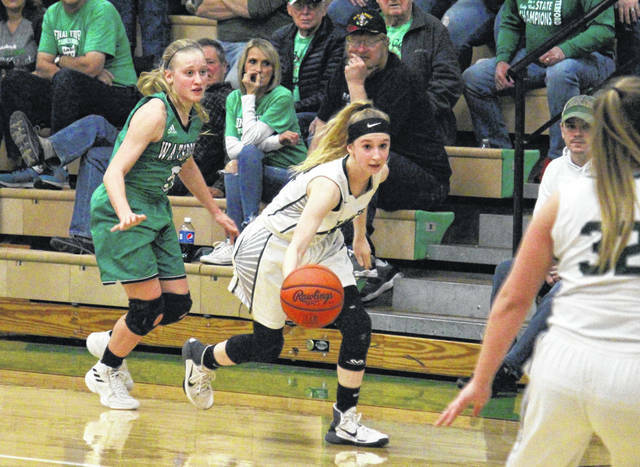 Kennadi Rockhold — who led the EHS defense with three steals and a rejection — contributed five points and six rebounds to the Lady Eagle cause, Casto added three points, while Whitney Durst and Ashton Guthrie chipped in with two points apiece. Sydney Sanders rounded out the home tally with one marker. Rachael Adams paced the guests with 16 points and nine rebounds. Cara Taylor was next with 14 points, followed by Emily Kern with 10 points, eight rebounds and three assists. Riley Schweikert marked eight points in the win, Maggie Huffman and Mackenzie Suprano each had two, while Brier Offenberger finished with one. Adams and Taylor led the WHS defense with three steals apiece, while Lily Roberts blocked a shot. Eastern was eight points closer than its last meeting with Waterford, as the Lady Cats won by a 47-30 clip on Dec. 28 in Washington County. The Lady Eagles will look to bounce back on Thursday at South Gallia.